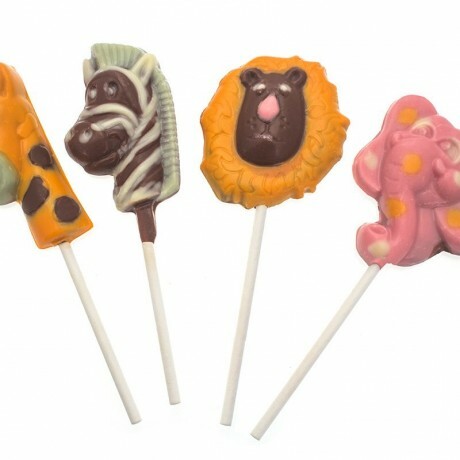 A great activity for children to enjoy painting but also making delicious chocolate lollipops! They can paint any design they like, maybe a pink Elephant with orange spots or a Zebra with pink stripes, it’s up to them! They’ll be really proud of what they’ve created! 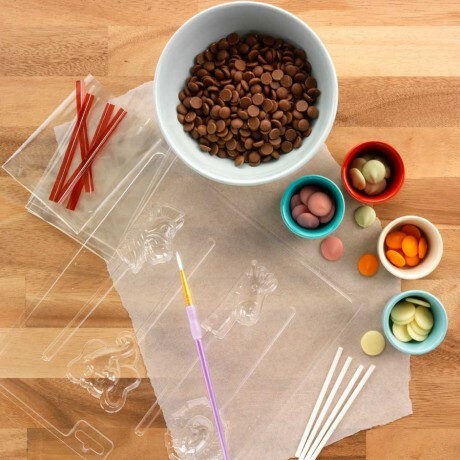 This children’s chocolate making kit makes a great present for any child, to make as part of a children’s party of for an activity at home. What else do I need? Nothing, we’ve included everything you need! What do I do? 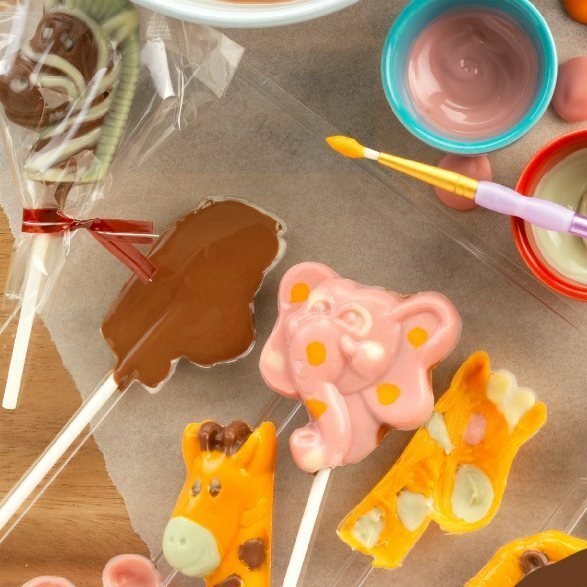 Just follow our easy step by step guide to make your lollies! Milk Chocolate – Cocoa solids 37% minimum. Milk solids 18% minimum. Ingredients: Sugar, cocoa butter, whole milk powder, cocoa mass, whey powder (milk), Emulsifier: soya lecithin E322, Flavouring: vanilla extract. Belgian White Chocolate – Milk solids 14% minimum. Ingredients: Sugar, cocoa butter, whole milk powder, Emulsifier: soya lecithin E322, Flavouring: vanilla extract. Strawberry Buttons: (not suitable for vegetarians) Ingredients: Sugar, cocoa butter, whole milk powder, Emulsifier: soya lecithin, flavouring, colour: E120, flavouring: natural vanilla flavouring. Orange Buttons: Ingredients: Sugar, cocoa butter, whole milk powder, Emulsifier: soya lecithin, flavouring: natural orange flavouring, colour: E160e, flavouring: natural vanilla flavouring. Lemon Buttons: Ingredients: Sugar, cocoa butter, whole milk powder, Emulsifier:soya lecithin, flavouring: natural lemon flavouring, colours: E132, E100, flavouring: natural vanilla flavouring. Contains: Milk, soya. May contain traces of nuts.